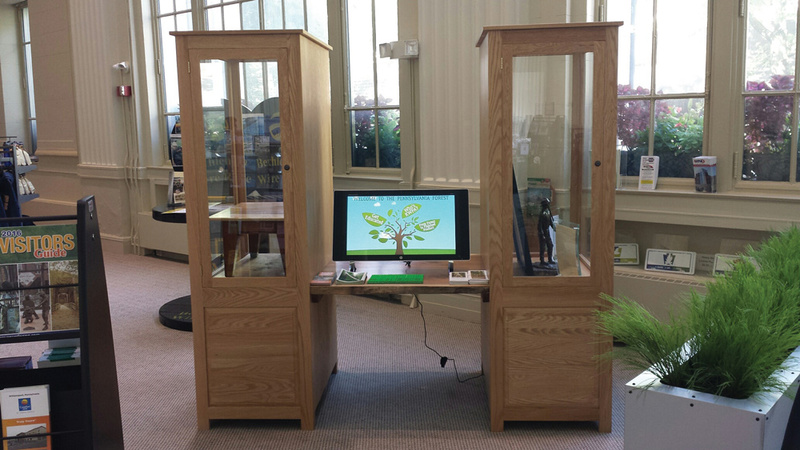 Lycoming County Visitor Center’s PA hardwoods display is now complete! With the installation of the interactive touch screen monitor created by Penn College in collaboration with KWPA, the display on Pennsylvania hardwoods donated by KWPA to the Lycoming County Visitors Center is now complete. The new interactive touch screen monitor allows visitors to study the growth rings of a cherry tree, watch a hardwood forest regenerate, learn forest facts, watch videos on furniture, pallet, and baseball bat production and learn more about KWPA. Now with the historical items generously on loan from the Lumber Heritage on one end and a beautifully crafted table from James Vanderlin Co. with lumber donated by Lewis Lumber Products on the other end and this new monitor in the center, the completed display gives visitors of all ages to Williamsport, (the lumber capital of the world) an informative introduction to our important industry.